Social media is vastly becoming its own enterprise for young entrepreneurs. It is a free avenue for people looking to market their businesses to a wide group of people. There is only one catch, you have to keep posting fresh material to keep your audience interested. 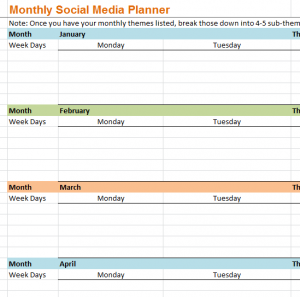 The Monthly Planner is here to help you plan out your marketing posts in the most efficient way possible. Download the free file below to help bring your business into the digital age! Once you have successfully downloaded the file by clicking on the link provided you will be able to start customizing your planner! All 12 months of the year are arranged for you by color. You simply fill out the weeks you want to make social media posts and write a brief description under a specific day of that week. At the end of each month there is also a blue box where you can leave yourself a convenient note. This is helpful in case you want to mark a certain amount of posts for that month or focus on a specific topic. Simply go through and fill out any information regarding your social media posts and platforms for the foreseeable future and you’ll have a precise calendar for keeping on top of your posts. When you have everything you want entered into the template you can easily print the document by selecting the “File” button in the top left corner of your screen and selecting the “Print” option form the drop-down menu that appears. By having your posts planned out and readily available you will save a lot of time and effort in your marketing strategies. It’s very easy to lose track of a social media platform and if you’re not updating the information with attention grabbing posts you’ll most likely lose your audience. This template has everything you need to master your online marketing plan!